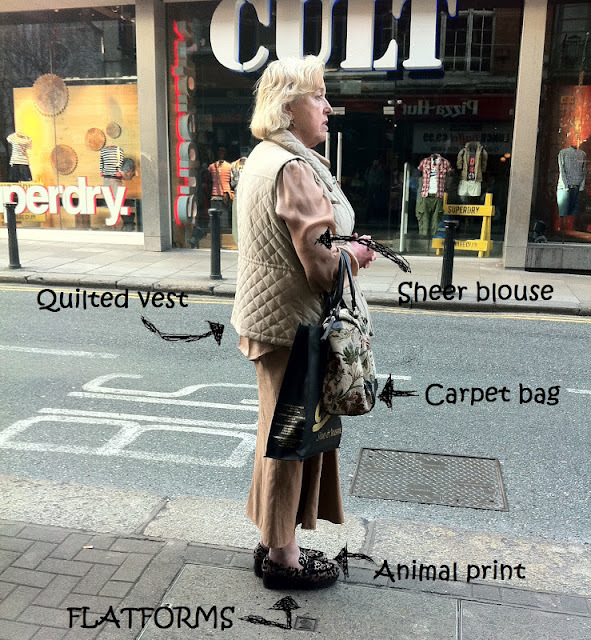 Anna K's blog on fashion in Dublin: Ageless fashion? Waiting for a bus after work last week I kept on staring at the lady standing right in front of me. She looked like a typical elderly lady, waiting on a bus. What initially caught my attention were her shoes. I have recently tried on numerous pairs of flatforms but I'm yet to find one that suits me. The lady beside me not only found a comfortable pair, she also got a pair in animal print! One by one I went through the individual pieces that made her outfit and I was shocked to see that a lot of them would be considered rather trendy! I couldn't help myself and ended up taking a photo of her. With Cult at the back, does it stand for ageless fashion?? I'm not convinced. Does that mean that you'll only rock these items as long as you're young, skinny and made-up? Possibly... how scary is that? What a true fashionsta! !Thanks so much for visiting and for your lovely comment!!! She's a true fashionista! I'm actually quite jealous because shes more fashionable than I am.